Rivers Edge is an exclusive family community featuring deed restricted executive homes on oversized lots – including riverfront and golf front properties. Quiet streets and sidewalks in this desirable, well-maintained neighborhood. Convenient proximity to town, beaches, schools & parks. Rivers Edge is located south of the Town of Melbourne Beach between Gemini Elementary School & Spessard Holland Golf Course. 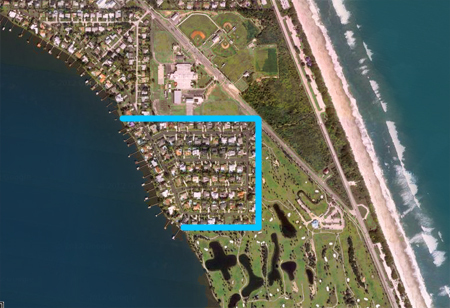 It is the last community accessible via Oak Street before it re-merges with A1A and heads off to the south beaches. Info: Landscaped entry, beautifully maintained, great location near schools, town, etc., sidewalks and quiet streets, very desirable family community. 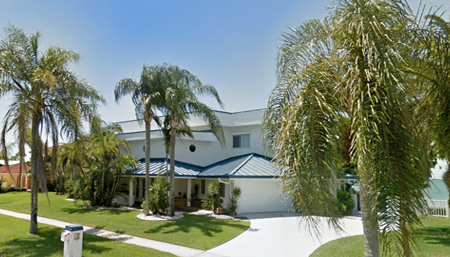 Low HOA fees – approximately $60/year. Beaches: Rivers Edge is on the river side of the island, and does not have a dedicated beach access. Convenient public access points are nearby, indicated by yellow stars in the map above. Parking (where available) and beach access are free of charge at all locations. 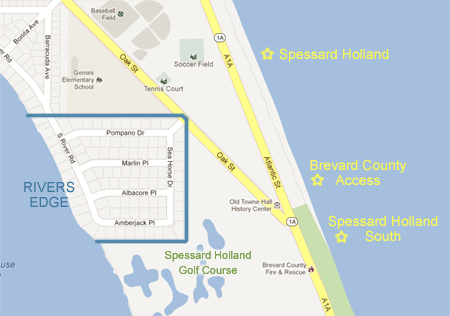 Spessard Holland offers excellent Brevard County beach parks with ample parking, showers, bath and changing rooms and picnic areas.